I just love listening to music, and I am not too particular on the type of music being played, as long as it makes me snap my fingers and slap my thighs. 🙂 Recently I found an app named Live Music Map by Apperdashery LLC. 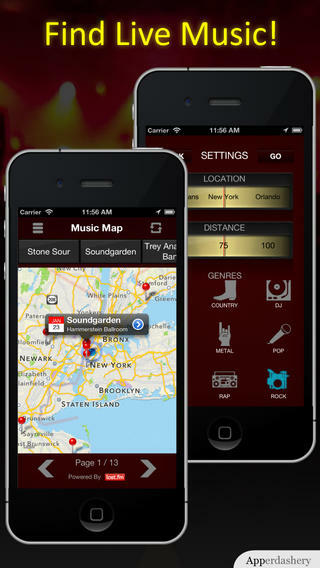 The app gives you information on live music events that are happening around you. This can pertain to concerts, shows, festivals, and more. The app is pretty specific about the details it provides, filtering the information based on distance, genre and location. The app not only focuses on concerts and shows held by huge artists, but also on bars and clubs that are near you which offer live music. You can set your location on the map to get information on concerts in the nearby areas, or specify any particular area that you are looking to attend a concert at. 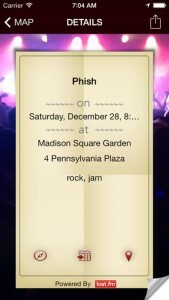 The app also helps you with settings that show music events within a given radius by setting the distance. If you are looking for a particular type of music, you can filter out events based on genre as well. The app supports about 32 countries and you can collect information on live music events that are happening in different parts of the world. After making your selection on the kind of music you are looking for and the location that you intend on traveling to, just swipe right or left to browse through the list of events. To get further info on the event just tap on it. You could also use the app to collect results on live music events based on the map center coordinates by clicking on the refresh button. Besides these features, you can add an event to your calendar from the app, get detailed information from the Last.fm website, get exact directions to the event venue, and share information using Facebook, Twitter, messages and email. After using Live Music Map, I never go running from pillar to post searching for music events; I just trust the app and make my move based on the details I receive. 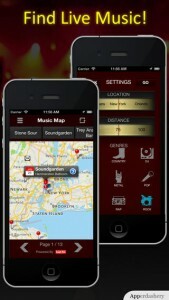 This is a must-have app if you are a music lover.